An ancient religious artefact is missing; the archeologist who discovered the priceless parchment is dead. 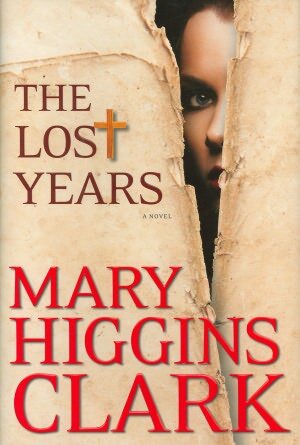 Mary Higgins Clark, the doyen of mystery stories, offers a long list of possible suspects in her new book – The Lost Years. When Jonathan Lyons is murdered and his wife, suffering from Alzheimer’s is suspected – found with the gun in her hand – her anger over his mistress places her at the top of the list. But wait. The only letter written by Christ to Joseph of Arimathea is missing before Lyons can return it to the Vatican. Did someone else kill Lyons to steal the letter and sell it to the highest bidder? Did his mistress, bereft over his leaving her to go back to nurse his wife, seek revenge for his betrayal? Were his colleagues ready to intervene for their own profit? 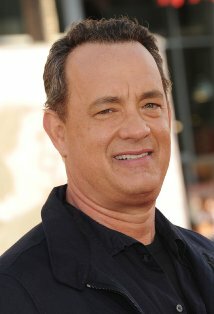 Will his daughter be able to protect her poor but maybe vengeful mother? Although the similarity to The DaVinci Code is obvious, with Clark, the red herrings and subplots are mindless. 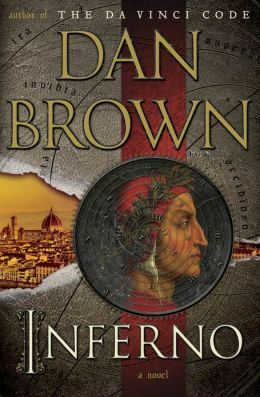 Without the caliber of Dan Brown’s intricate plotting, Clark’s tales are reliable but predictable. The book is relatively short, with lots of white space; the language is simple; this was a “hot pick” at my library – returnable in 7 days – all strong motivators for a quick read but it wasn’t. After getting mired down in the repetition and minutia, I finally skipped over the pages of Clark’s descriptions of making a turkey sandwich and got it done already. Despite the many red herrings, the murderer was obvious. But I read to the end to confirm. I have not read a Mary Higgins Clark mystery in a while, but I remember them being more enjoyable. Her fans will probably like The Lost Years; she does stick to her successful formula. But I’ve had better from her. 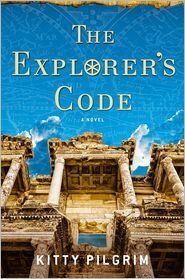 With a fast-paced mix of oceanography, archeology, and virology, Kitty Pilgrim’s The Explorer’s Code offers an adventure with action that mixes DaVinci Code with Indiana Jones. Add a handsome rich hero and a beautiful intelligent scientist, the panoramic views of Monaco, an ocean cruise along the Riviera, a search for treasure, and expect to fall into a formula that will meet all expectations. Cordelia Stapleton interrupts her research to travel to Monaco to receive an award in the name of her great-great grandfather, a polar explorer. Along the way, she becomes an heiress and then meets handsome and rich John Sinclair, who dabbles in philanthropy and digging up treasures in Ephesus. A group of sinister Russians and Texas evangelists are stalking Cordelia, hoping to find a valuable Arctic land deed she has inherited. The CIA is following them all, along with a potentially lethal virus lurking near the deed. The cryptic clue to finding the deed is in her grandfather’s old journal, and they all follow her to Paris, London, and finally Longyearbyen, Norway, about 800 miles from the North Pole. 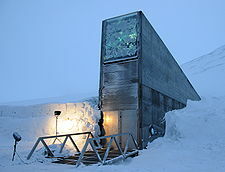 the facility that preserves a wide variety of plant seeds in an underground cavern to provide insurance against the loss of seeds from a global crisis. The site actually exists and is partially funded – in real life – by the Bill and Melinda Gates Foundation.